One of the dreamiest and most romantic, breathtaking places in the world- Capri, Italy. Logan and I kept pinching ourselves the whole entire trip, and saying “I cannot believe that we are actually here.” Logan and I studied abroad together our Junior year of college, and it is some of the best memories we have together as a couple. I knew that this trip to Europe would be no exception, and this time- no school would be involved! 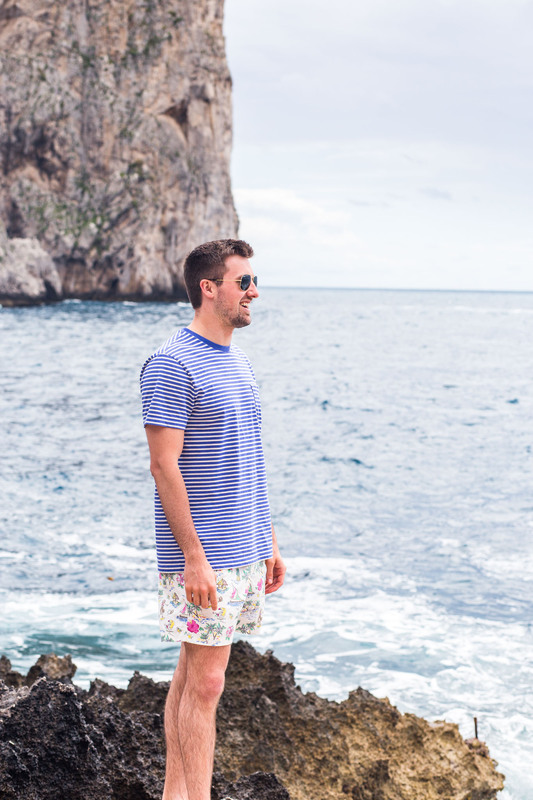 Because the coast of Italy there primarily rock beaches, Logan and I were on the hunt for the perfect place to lay by the water and soak up the sun. I stumbled upon La Fontelina on Pinterest, and it was one of the most magical places I had ever seen. Take a look for yourself here! With the iconic blue beach umbrella and chairs, I knew it would be a picture perfect place to spend the afternoon. 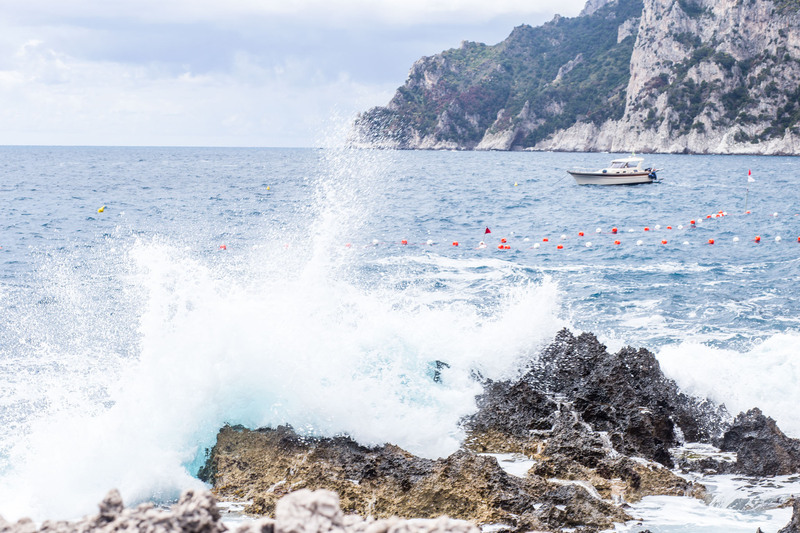 I shared a little bit about our visit to La Fontelina in my post about visiting Capri and the Amalfi Coast, but I thought it deserved its entirely own post too. 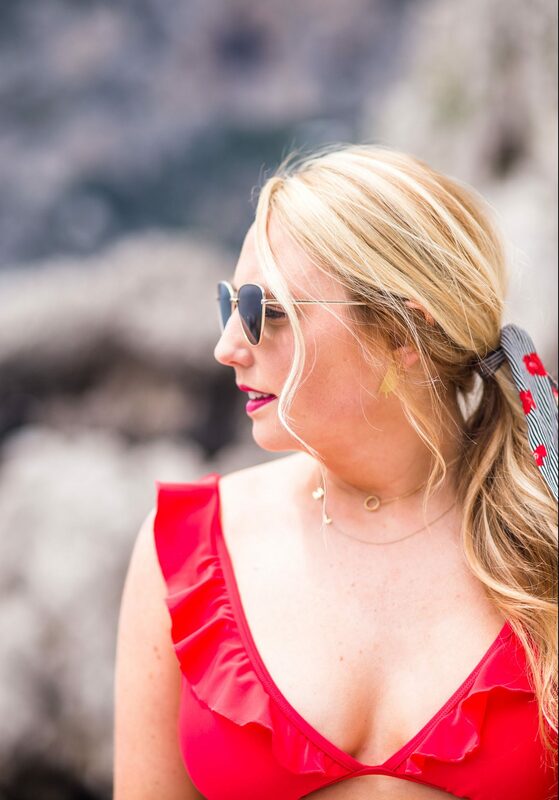 This was hands down one of the best things that we did in Capri! It was so private, and one of the prettiest views you could imagine. La Fontelina is perfectly positioned in front of Faraglioni, one of the most iconic towering three rocks of Capri. La Fontelina even says on their website that you might be lounging next to Hollywood’s most famous, and they weren’t kidding! Just a few weeks after our visit, I saw that Kourtney Kardashian spent a few days lounging at La Fontelina. 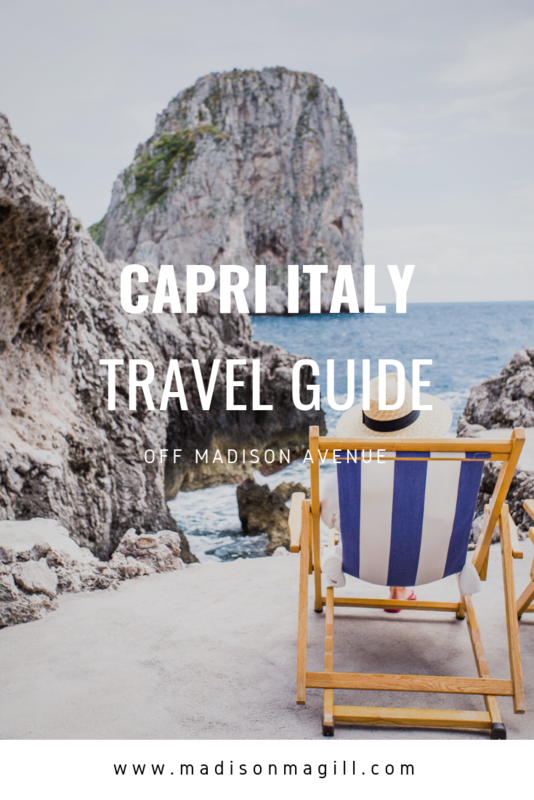 If you are visiting Capri, this is definitely a must! Be sure to prepare ahead, and use the tips below! La Fontelina is open from late April to mid October, everyday from 9am to 7pm! Their restaurant is open daily for lunch from 12:30pm to 4pm! They have two lunch reservations, included with your beach chair rental at 1:00 and 3:00pm! Entry with use of changing room, shower, sun lounger or deck chair is 26 Euro per person! They also offer additional amenities for an additional charge such as an umbrella, and towel. The only way to get to La Fontelina is by boat, or walking down a long path. We choose to walk there, and we took a boat back! It was perfect because the walk is truly beautiful, but it would have been too much if we would have walked back as well. Our private boat tour picked us up at the dock at La Fontelina, took us on our tour, and then dropped us off at the main dock close to our hotel. This ended up working up, much better than I could have planned, because it saved us a walk back! You have to email them 24-48 hours in advance to rent a chair. When you rent a chair, it also gets you a reservation at their private restaurant. They had hands down the freshest Caprese salad I have ever had in my life. You can make a reservation by emailing them here.